In this short blog post I will talk about a landlord who used The Good Agent to let his property and saved over €1,300 doing so. The landlord had spoken with a couple of agents and they told him that the rent that he was previously getting (€2,000 per month) was way too high and was advised to lower it to €1,450 per month. This seemed a bit ridiculous to the landlord as the previous tenants, the ones paying €2,000 per month, had just moved out. The property was rented on a 12 month lease for €1,850 per month… slightly higher than the €1,450 quoted by the other agent. As our customers only pay for the services they use, The Good Agent’s fee came to a total of €781 including VAT compared to the one month’s rent plus VAT that most agents take. Also, €249 of this was for the BER cert and PRTB registration which most agents would charge on top of their fee. And we won’t even mention the loss of income from underestimating the rent potential. At The Good Agent we believe that everybody has it in them to sell (or let) their property themselves so we provide some guidance for people who want to do so. On our site (www.thegoodagent.ie) we break the selling and lettings processes into handy steps and at each step we provide the tools, advice, and support that enable you to carry-out that step. In this blog we will post that advice. What’s the catch? I don’t think there is one. You could like us on Facebook (here) if you want to or just share this with someone who might find it useful. Crucial, is the word I would use to describe your property’s brochure. Something like 90% of people start their search for properties online (if we are to believe Daft’s marketing campaign) and this doesn’t surprise me. In fact, I’m surprised it isn’t higher. The first thing people search by is the Triumvirate of location, bedrooms, and price. You can’t change the first two and you’ve probably had some guidance (be it formal or otherwise) on the price so, for the moment, that is also fixed. Once searchers have a list of properties that match these criteria, they do two things: read the blurb and look at the photos, i.e., inspect the brochure. Their next decision – view or not to view – is made at this point. That is why your brochure is so important, but, delightfully, it’s pretty easy to get right. Using high quality photographic equipment, specialist software and several years experience… to produce exceptional images… in order to give your property the additional aesthetic boost to assist in making your property stand out, bringing people through your front door and even introducing purchasers. More viewings, means more of a chance of selling at a better price. In summary: You’re not going to get beautiful photos using the camera on your phone; get a professional in and let him/her to their thing. It’s worth it in the long-run. Floorplans aren’t always essential, but some viewers like to be able to picture the size and layout of a property before viewing. Posting floorplans in your brochure means that people who view the property will have a much better idea of what to expect so won’t be surprised by, for example, a small bathroom. Floorplans normally result in a higher quality of viewers. Sell your property. (I told you some of these were obvious!) Be positive throughout your brochure. Use language that makes the property sound attractive. The goal of the brochure is to make the reader take the next action; that action could be just getting them to call you for more information or it could be to make an offer. Stay honest. There may be times when you need to sweeten-up the truth; for example, “Needs TLC” is an acceptable way to describe a property that needs work as it conveys a truthful message in a positive manner. However, to state that that same property is in turn-key condition is not acceptable as it is misleading. Know your audience. If you are selling a property that will appeal more to families, keep this in mind. Tell them about quiet neighbours or near-by schools. Similarly, if your property is more likely to be bought by young professionals, list entertainment hot-spots like popular pubs. Grammar. This isn’t your thesis, but it is always good practice to avoid spelling mistakes and poor grammar. Utilities: which utility providers operate in your area? Is broadband available in the area? Do all of the cable / satellite television have a presence in the area? Be clear, be concise, be factual. Describe the layout of the property, i.e., what rooms are downstairs and what rooms are upstairs giving a brief and specific summary of each room and highlight any features of interest. For example, “Upstairs there are 2 bedrooms with the main bedroom enjoying the large circular bay window which includes feature stained glass”. When people are looking for a property, they will have certain things that they will be looking for, so you don’t want to lose a potential buyer just because you forgot to list something. When adding a room, think about the type of room that it is, the features that a buyer would be looking for in that type of room, and which of those features your room has. Clean-up outside, e.g., cut the grass, take down a washing line, put garden tools away, hide children’s toys, power-wash the driveway, buy some cheap plant pots, table and chairs. Rent a storage unit, if necessary, or do a good deed and bring it to your local charity shop. Remove items that you want to take with you or don’t want the new tenants to have. Consider painting your walls neutral colours, i.e., GET RID OF THE PINK WALLS! There may seem to be a lot of tasks, but trust us: this up-front effort could (a) find a tenant faster and/or (b) get you higher rent. You can always rope in family and friends to help as long as you provide refreshments and don’t treat them like personal slaves for the day! In this blog we will post that advice. What’s the catch? I don’t think there is one… oh, maybe you could like us on Facebook (here) if you’re feeling generous. Or just share this with someone who might find it useful. Make sure that you and the property are presentable. Clean, tidy, paint, and repair anything that needs… eh… cleaning, tidying, painting, or repairing. Remember that very simple things can make a difference, e.g., make sure the lighting is flattering and there aren’t any bad odours. Also, make sure that you look the part and make the viewers feel at home. Organise viewings in blocks. The advantages to this are three-fold: (1) it is much more convenient for you to show several people around at the same time rather than lots of individual groups, (2) prospective buyers will see that other people are interested and it is human nature to become more attracted to something when we know a lot of other people want it and (3) it is also human nature for people to forget/not bother about appointments so, if you have several viewers, you will not be left twiddling your thumbs in this situation. This applies to most business deals (and, at the end of the day, that’s what this is): don’t appear desperate. This will put the balance of power in the prospective buyers’ hands and it may affect the price that you are offered. Over the last few weeks we have been conducting a spot of very simple and quasi-scientific research into what Irish people really think of estate agents. 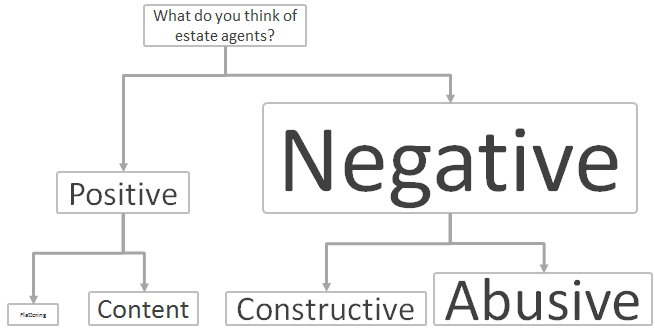 We posed just one question to the public: What do you think of estate agents? 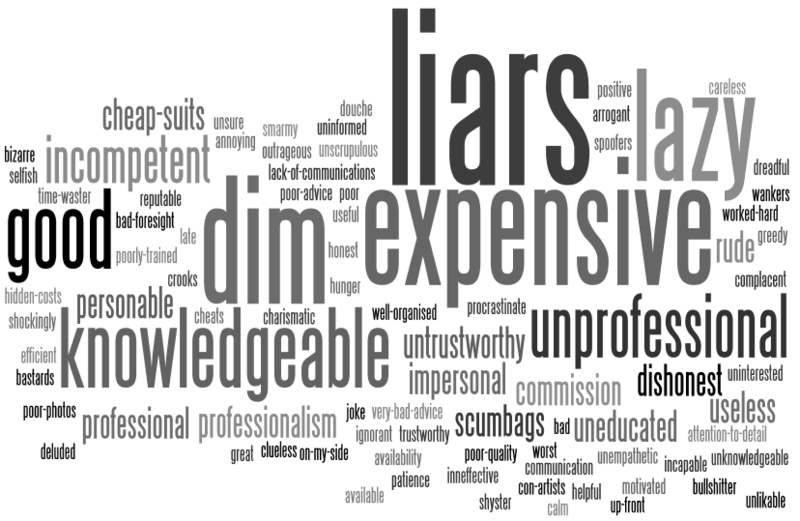 This image, created using Wordle.net, displays all of the responses. The bigger the text, the more common the response. Be aware that we received some “colourful” responses and they have not been removed from the image below. To put the above responses into perspective, we classified the responses. Again, the size of the text represents how many answers fell into that category. The word you might be struggling to read is “Flattering”. Is any of this surprising? I don’t think anybody will fall off their seats when they read this. It is interesting to see such a negative reaction to a profession that is essentially a middle-man. Maybe if more people knew that they don’t need to use estate agents, the public view of the profession would swing back towards the positive. If I was an Internet scammer, I think the first thing I would do is hire an English speaking proofreader. During your time as a user of the Internet, you have probably received more than one email from a “Prince” of an exotic country who has singled you out as the only person who can help retrieve his inherited fortune and, if you agree, he will give you a prize worthy of his princely status. The most obvious sign that this email is a hoax is the odd wording. These scammers have found Daft and MyHome. A variation on the above scenario has developed in which attractive rental properties are listed and the landlord is asking for a deposit and one month’s rent placed into his/her bank account. That doesn’t sound outlandish, after all, a deposit and one month’s rent is standard. So, how do you spot these scams? A good example of such a scam can be found here: http://www.myhome.ie/1252092. I have contacted MyHome about this scam so, if that link doesn’t work, they have taken down the ad. What are the signs of such a scam? The photos don’t seem to represent a real property, i.e., they look like they are copied from a magazine. The rent seems to be very low. The property linked to above is asking for €900/month for a very high specification two-bed apartment on Upper Leeson Street. The monthly rent and the deposit don’t match. The landlord is based abroad. Viewing the property isn’t possible. The tell-tale odd-sounding use of English. More subtle items such as the plug sockets in the photos look like they are for round rather than square plugs. Lastly, I don’t think any landlord I’ve ever dealt with would tell me to “Stay Blessed”. In summary, be aware that these scams are out there and treat too-good-to-be-true deals as just that. This site (http://www.scamwarners.com/forum/viewtopic.php?f=39&p=45035) has a whole section on this type of fraudulent ad. In this blog post I will look into five common believes about estate agents and some arguments that go against those beliefs. Commission based pricing leads to higher sale prices: In Ireland, most estate agents price their service as a percentage of the final sale price. This can be anywhere between 1% and 2%. If you ask an estate agent who charges commission on a sale why they do it this way, it is likely that you’ll get an answer that goes a little something like this: “By charging a commission on the sale price we are encouraged to get the highest price possible for your property.” Okay, but if someone has instructed them to sell their house, shouldn’t they be trying to get the best price for their customer’s property anyway? Also, consider this situation: Anne is selling her house and it’s listed for €350,000. Anne’s estate agent, Bob, receives a bid for €340,000. In this situation, are Anne and Bob looking for the same outcome? If Anne sells for €340,000 she loses out on €10,000 (a large amount of money). Let’s say Bob is charging 1.5% as his fee, so he will only lose out on €150. It is quite obvious that there is an incentive for Bob to “encourage” Anne to sell at that price rather than spend another week or so trying to get Anne’s asking price. This point is further illustrated by the University of Chicago’s study that looked at houses that belonged to estate agents and how much they sold for and how long they stayed on the market. It found that, when an estate agent sold his/her own house, the house sold for 3.7% more than other houses and stayed on the market for 9.5 days longer. This shows that when agents are also the vendor looking for a particular price, they are more willing to keep it on the market a little longer. The complete study can be found here. In general, it is more beneficial for a commission based estate agent to sell a property quickly than for the right price. Have a read of a our blog post on a real life example here. Estate agents take care of a lot of legal jiggery pokery when selling a house: I think this myth is especially true in Ireland. The main goal of an estate agent is to introduce a buyer to the seller. When it comes to the legal stuff, it’s time for the solicitors to step in; this is a completely different service than what your estate agent provides. “No sale, no fee” benefits the customer: This is an interesting one. Traditional estate agents have an image of being very expensive, but why do they charge so much? A lot of it has to do with the “No sale, no fee” model. If an estate agent doesn’t get paid until a house is sold and they have some houses on the books that are more difficult to sell than others, then they will have to make up the cost of taking on those tricky houses by increasing your fee. So, in fact, you are not only contributing towards the cost of selling your house, but also towards the cost of selling other houses too. Doesn’t seem right, does it? Estate agents are a necessary evil: Firstly, it isn’t a prerequisite for all estate agents to be evil (some of them are actually good), but I think the craziness of the second half of the 1990s until c.a. 2007 led to a bit of greediness in the industry which, in turn, led to a negative perception of estate agents in Ireland (they commonly appear in “Top 10” lists for most hated professions). Secondly, estate agents aren’t actually necessary. This ties into the second myth in this list. It is perfectly legal, acceptable, and financially beneficial to sell or let your property yourself. The steps involved in doing this are straightforward. If you would like to read a case study on a man who sold his house himself without any previous experience, you can do so here. Estate agents have a unique list of buyers that only they know about: It may well be true that your estate agent has the numbers of some people that are in the market for a house, but I doubt there are any buyers out there that would declare their interest to one estate agent and leave it at that. It is an undeniable fact that the vast majority of people looking for a place to buy or rent will also look online and keep their eyes open for “For Sale”/”To Let” signs, even the ones that declared their interest to a few estate agents. Traditionally, Daft is the place that people go to find a place to rent and MyHome is the place to find a place to buy. They both list sales and lettings, but each has its strengths. What is The Good Agent?